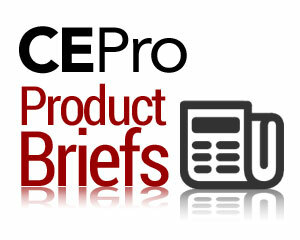 So many product news items come across the CE Pro desks, and we don't want to miss them. Neither do our readers. This is the place where we tell you what's now shipping, which reps and distributors picked up what new products, which products are newly compatible, how public companies are faring, and other briefs in custom electronics. Catalyst AV member, HCA Distributing is now a Harman Professional distributor. “We have initially stocked JBL Control Series 70 Volt speakers, JBL branded 70 Volt amplifiers and Crown Amplifiers, says Ron Perron of HCA Distributing. “Our distribution of this legendary brand, enables HCA dealers in Colorado; and regionally in Utah, Wyoming, Eastern Idaho, Western Montana, New Mexico, and El Paso, Texas, to get their hands on Harman Pro products more rapidly. Prior to this, national distribution was handled on both coasts." Crestron, a global manufacturer of advanced smart home technologies, has announced the release of the Crestron Performance UI, a new user experience designed exclusively for the TSR-310 handheld touch screen remote. The Crestron Performance UI integrates natively with the Crestron PyngOS 2 operating system, giving residential integrators the power to deliver unique user experiences from a handheld remote. Integrators can download the latest Crestron Pyng OS 2 update now to see how the TSR-310 UI instantly updates to the Crestron Performance UI. WiSA LLC, WiSA, the (Wireless Speaker and Audio) Association, an industry group comprised of over 40 brands, including founding member Summit Wireless Technologies, has introduced “WiSA Endorsed” for audio amplifiers designed for use in powered home audio speakers. This new designation coincides with the launch of member brand Infineon Technologies MERUS MA12070 4-26V ultra-efficient audio amplifier, which is the first amplifier to receive the endorsement. Amplifier solutions with the WiSA Endorsed designation will be designed into a complete powered speaker solution that has passed WiSA Certification. These WiSA Endorsed amplifiers can then be designed into products by audio brands and manufacturers with confidence as they pursue WiSA certification. HARMAN’s Mark Levinson has announced a firmware update for its № 519 Audio Player. The № 519 is now Roon Ready. Roon is a solution that enables users to browse, organize, and listen to music. Artist photos, credits, bios, reviews, lyrics, tour dates, and composers are located automatically, then interconnected by links to build a surfable digital magazine about your musical taste. Going beyond a personal music collection, Roon lets a user explore millions of tracks on TIDAL through the lens of the user’s collection. Roon is also a multiroom, multi-user networked audio platform, it offers features such as bit-perfect playback, DSD and PCM upsampling, multichannel support, and Signal Path display. Because the Nº 519 is Roon Ready, it requires no configuration to work with Roon; just connect the 519 to a network. The Mark Levinson No519 is now also certified with the MQA Full Decoder, which enables playback and authentication of MQA audio files and streams. The No 519 delivers full MQA playback while streaming MQA files from Tidal or Roon, playing through a USB drive, listening to an MQA-CD or via DLNA. Integra joins the growing ranks of MQA partners, arming its DTM-6 and DTM-7 with MQA full decoder ability. The U.S.-based brand is a popular manufacturer in the custom installation sector, recognized by industry professionals for its integration friendly products. The DTM-6 and DTM-7 are both network stereo receivers and are equipped with an extensive list of user-friendly features, including integrated dual-zone audio, voice control, as well as Integra’s Control Pro app. Pioneer is another brand to already offer a number of MQA-enabled products, including portable players, and this latest announcement sees the manufacturer enabling a pair of its network-ready models. The SX-N30AE stereo receiver now offers full MQA decoding, adding to its already impressive suite of features, including native support of TIDAL and Pioneer’s Remote App. Joining its stereo receiver sibling in an MQA upgrade, the N-30AE network audio player helps users get the absolute best from their digital music libraries and, like the SX-N30AE, it supports FlareConnect multi-room standard. Legrand, the global manufacturer of AV infrastructure, networking and digital systems, has announced three new IP-based drivers that will simplify the integration of its radiant and adorne lines’ RF lighting control with Control4, Elan and RTI home automation systems. The new drivers eliminate the need for RS232 to RF interfaces for third-party integration, saving time and money in installations. Now Legrand’s LC7001 Whole House Lighting Controller will work as a bridge that can communicate with the Control4, Elan and RTI control systems. The European consumer audio company Pro-Ject has announced a vinyl release of the Vienna Philharmonic Orchestra under conductor Karl Böhm: "Beethoven’s Symphony 6 „Pastorale“ and his Overture Egmont." Recorded in the famous Golden Hall of the Wiener Musikverein, this LP now has been carefully remastered by Georg Burdicek from the original master tapes. A showpiece for pure analog music enjoyment, this is the first Pro-Ject Music release and it will be exclusively distributed by Pro-Ject Audio Systems. Lenbrook International, a maker of high-resolution audio hardware and software solutions, has announced that a first set of Amazon Alexa Skills for its BluOS Hi-Res distributed audio platform will be available January 15, 2019. Users of BluOS enabled products from Bluesound, NAD Electronics, and DALI Speakers, will benefit from hands-free control of their music from any Amazon Echo device. Amazon’s Alexa represents the first platform-wide voice control integration for BluOS in a broader voice control strategy that seeks to offer users a choice in which voice assistant they use. This strategy includes the creation of BluVoice, the voice-control interface that acts as the intermediary between BluOS and a compatible voice assistant. For example, BluOS users can ask their Echo device to deliver music playback commands to their BluOS Enabled device via BluVoice with phrases like, “Alexa, ask BluVoice to play preset one in the study,” or “Alexa, ask BluVoice to play new songs on Tidal." Leviton has announced the launch of its LED Compatibility Selector Tool, a new online resource developed to make it easy for customers to identify LED bulbs that are most compatible with Leviton dimmers, or to identify a Leviton dimmer most compatible with their existing bulbs. As LEDs have become the standard when shopping for new or replacement light bulbs, it is increasingly important for consumers to ensure that the dimmers and LED bulbs in their home or business are compatible when used together for optimal performance. In order for the tool to effectively help customers, Leviton has an ongoing program to test and evaluate LED bulbs and fixtures for compatibility with Leviton LED dimmers. The test program identifies best performing bulbs as well as those exhibiting any irregular functionality, such as flickering or limited dimming range. This information helps users successfully pair Leviton dimmers and LED bulbs that will achieve the best performance. “With our ever-growing database of bulb compatibility information, including the most popular brands available at retail and distribution locations across the country, our LED Compatibility Selector Tool is intended to eliminate the frustration of potential dimmer/LED compatibility issues,” says Bob Becker, executive vice president/general manager, residential, for Leviton. “By providing an easy and intuitive way for customers to find compatible products, we’re helping them understand exactly what they need for the best lighting in their home or business. Silicon Labs has launched its next-generation Z-Wave 700 on the Wireless Gecko platform, which it says is a hardware and software connectivity solution for the Internet of Things (IoT). The new smart home platform builds on Z-Wave’s S2 security and interoperability by improving energy efficiency and adding higher performance, longer range RF capabilities. By leveraging the Wireless Gecko platform, Z-Wave 700 enables developers to create new classes of smaller, more intelligent smart home products at a lower cost and faster time-to-market. “With the worldwide smart home market expected to grow to 1.3 billion devices shipped annually by 2022, much of that adoption and growth will be driven by sensors that enable AI and edge computing applications, which can deliver smart experiences in new verticals such as security, aging-in-place, energy, voice control and insurance,” says Adam Wright, senior analyst, consumer IoT, IDC. RTI, a global control and automation manufacturer for residential and commercial settings, has announced the availability of a new driver for Qadvanced automated roller shades from QMotion, a brand of Legrand. With the new driver, developed by Intrinsic Group Limited, integrators can incorporate QMotion's motorized shades into RTI control and automation systems. Offering virtually soundless operation in hard-wired or battery-operated versions, Qadvanced roller shades feature a simple, sophisticated design that delivers both ease of use and dependability. With the new driver, users can create and control motorized shade groups, including handheld controllers, touchpanels, in-wall keypads, and the RTiPanel app for mobile devices, throughout their home or facility from RTI's control interface options. "Known for their reliability and sophisticated designs, Qadvanced roller shades are the solution of choice for many integrators," says Ed McConaghay, CEO, RTI. "We're thrilled to add the QMotion driver to our library and further unify the control experience across homes and commercial facilities featuring RTI systems." Centralite Systems, Inc., a manufacturer of reliable, wirelessly connected devices based on the Zigbee home automation platform, has announced that its 3-Series Micro Motion Sensor and Micro Door Sensor have been certified to work with Echo Plus, Amazon’s popular voice assistant. Amazon recently added support for motion and door sensors to Echo Plus; with this announcement, Centralite becomes one of only two hardware partners whose sensors have been designated as “Works with Alexa” devices in connection with Echo Plus. Crestron has partnered with the low-voltage lighting company Lumastream to install its lighting products into the Crestron Design showroom in Houston, Texas. The newly opened showroom features a range of Crestron technologies and solutions to help local integrators demonstrate Crestron smart-home solutions. Bluesound, a developer and manufacturer of wireless multiroom music systems, has announced that all Generation 2i streaming music players will receive a much-anticipated software update that will enable Apple AirPlay 2, allowing users to stream audio from their iPhone, iPad or Mac computer to Bluesound. On Dec. 11, all Bluesound customers will be prompted to update their players to the latest version of BluOS, Bluesound’s proprietary hi-res multiroom platform. For customers with Bluesound’s newest Generation 2i players, the software update will enable AirPlay 2. Gen 2i users can then stream music services, podcasts, audiobooks, movies, games, YouTube audio, TV sound and stored music from their iPhone, iPad, or Mac computer to any Bluesound Gen 2i player on the same WiFi network. The integration also gives Apple Music listeners the ability to control playback on their Bluesound Gen 2i using Siri voice control. Multiroom streaming: Customers can now control their wireless speakers right from the Nativ App, including SONOS, Denon HEOS, Bang & Olufsen, Amazon Fire TV, Roku and Samsung. Speakers with Google Chromecast and Apple Airplay protocol are also supported. Roon: The Vita Hi-Res Music Server supports the incredibly popular Roon music management software. With version 3.0 customers can launch the Roon Remote app from inside the Nativ Apps, allowing them to browse and control the Vita through the Roon interface.Browsing performance: Software 1.5.0 brought considerable User Interface performance improvements to the Nativ Vita. These are now also available through the Nativ Smartphone apps, improving the browsing speed by 70 percent and more. Capitol, a national consumer electronics distribution source for residential systems and light commercial contractors, has launched the second phase of its annual Holiday Flyer program featuring several of the most popular products in the smart home, audio, video, and networking categories. The second flyer of the 2018 holiday selling season features home networking giants such as Google, with the in-demand Google Home Hub, one of the new generation of smart displays that combines the functionality of a voice-controlled smart speaker with a screen for watching videos, browsing recipes, controlling compatible smart home products, and so much more. For dealers with commercial customers, Capitol is highlighting multiple new AV models, including Onkyo’s PCA1120 power amplifier and MCA1120 mixing amplifier. Kaleidescape, a manufacturer of luxury home cinema video systems, has announced a partnership with BBC Studios – Americas to bring BBC documentaries and TV series to Kaleidescape. The deal marks the first time Kaleidescape has offered episodic content in 4K Ultra HD and high dynamic range (HDR). URC, a global manufacturer of control and automation for residential and commercial settings, has announced the introduction of the new URC Total Control 2.0 module for IP control of all 2018 LG UHD TVs including the LG OLED and LG Super UHD TV models. The URC module supports the full control command set for all 2018 LG UHD TVs. It enables a wide range of customization possibilities, including an extensive selection of macro integration possibilities. Additionally, it offers direct launch options for end user Net Service Applications, such as Netflix, YouTube and Hulu. “We are pleased to partner with LG to provide our mutual customers in the custom installation space with extraordinary home theater, single-room entertainment and whole-house distributed video experiences,” says Doug Cole, senior vice president and general manager, URC. CEDIA has released a new white paper – "An Integrator’s Guide to HDR Video." This paper explores the fundamentals of HDR video and how it relates to human vision, and underlines HDR standards, formats and connectivity to ensure compatible system design and integration. “We have seen incredible advances in HDR over the years to the point that it is an executable display option in home environments, but not without some guidance. This white paper is intended to provide a baseline knowledge of HDR to assist with the specification and deployment of the consumer HDR video systems,” says Walt Zerbe, senior director of technology & standards, CEDIA. A key directive of CEDIA’s current strategy is creating standards, developing best practices and defining guidelines to elevate professionalism and drive member and industry success. This white paper is the first of three white papers that will be released before the end of 2018. CEDIA is also evaluating more than 30 topics for 2019 with a goal of publishing six white papers in the coming year. The new IP camera drivers from IC Realtime for Control4 are SDDP capable and Control4 certified. Control4 connected IC Realtime cameras will now automatically be discovered. For integrators, it reduces deployment time and access to motion detection controls within Control4’s programming to activate lighting scenes, play audio, and automate a house environment. Integrators simply double click the identified devices to install the driver. More than 44 of IC Realtime's high-end surveillance camera models are now supported. Qobuz, a Hi-Res audio streaming and download service, has spent the fall laying the groundwork for its early 2019 US launch. Providing the first opportunity music fans in the United States will have to experience true Hi-Res audio streamed, Qobuz has already secured a multi-million track Hi-Res catalog ahead of launch, and it has just announced its U.S. pricing plan. The service's 24-bit streaming FLAC files can be played on any equipment and require no special processing. Qobuz allows unlimited importing of music in any quality on all the user’s devices. Sublime+: $299.99/year for full Hi-Res streaming and substantial (40 to 60 percent) discounts on purchases from the Qobuz Hi-Res (up to 24-bit / 192 khz) download store. Luxul, a manufacturer of IP networking solutions for AV integrators, has announced that it has strengthened its partner program with the recent addition of several strategic, integration, and industry partnerships that deliver added value to the company's integrators and their customers. "Professional-grade networking products form the foundation for residential and commercial systems, but they are only part of the overall solution," says Mike Grubb, vice president of marketing at Luxul. "It takes a wide range of components to deliver the experience customers want, and we don't believe integrators should be limited to specific components by their network manufacturer. That's why we've partnered with a number of industry-leading manufacturers to ensure compatibility between our products and many others, while also incorporating their advanced technologies into our solutions to deliver increased functionality. The result is a seamless installation process over a wide range of solutions for integrators and optimal performance for their customers." Atlona, a manufacturer of AV collaboration and control products has announced that it has joined the D-Tools’ Cloud and i3 (Industry Information & Insight) Program. Atlona’s participation provides D-Tools’ software users access to the company’s detailed product specifications and related information for use in their sales, system design, documentation, procurement, and project management of low-voltage systems. KEF has announced the addition of Spotify Connect and Roon streaming playback to LSX, which is KEF's two-speaker, all-wireless music system. With built-in Spotify Connect, Spotify’s entire library can be streamed directly from the cloud without interruption via high-quality network connections. On their handheld devices, users can watch videos, play games, answer phone calls and more, without causing pauses or interruptions to the music. With the integration of Roon streaming playback, you can take of advantage of the full high-resolution audio capabilities of the LSX while enjoying the flexibility of networked audio and the amazing Roon music browsing experience. If you own other streaming platform devices-Chromecast, Airplay, Sonos, Roon Ready- Roon will allow users to combine their LSX systems with these other devices as a complete system, managed by one app. Portal.io, the online purchasing platform for custom installers, announces Sonos has joined Portal Select, a group of vendors that offer free three-day shipping and cashback rewards on select products. Portal says it now has more than 8,000 "verified in-stock products" in the Select portfolio. "Our goal with Portal Select is to give our dealers an unmatched buying experience. Sonos’s commitment to the channel makes them an ideal addition to our platform," says Kirk Chisholm, CEO and founder of Portal. Telguard released new voice commands for HomeControl Flex, its interactive service solution. Using Alexa, HomeControl Flex subscribers can arm their security system and ask the status of the alarm system. A recent survey with Clear Seas Research found that nearly two-thirds of security professionals are highly interested in identifying a “voice-operated feature” to offer to residential customers for use with current or future home security systems. Four-in-five security professionals expect residential customer requests for security voice-operated alarm systems to increase over the next year. Klipsch is gearing up for strong Black Friday sales. As part of that effort, the company is donating a portion of the proceeds to The Autumn Leaves Project, a nonprofit dedicated to aiding those battling pancreatic cancer. The goal is to raise at least $20,000 from Thanksgiving Day to Giving Tuesday November 22-27, 2018. The Autumn Leaves Project was founded in 2013 by legendary singer, songwriter, and producer Butch Walker. Walker founded the organization after his father passed away suddenly from pancreatic cancer to optimize the quality of life for those diagnosed.“Pancreatic cancer doesn’t give you a chance to reconcile with it, doesn’t let you make plans sometimes or prepare for the ending; it just usually sneaks up on you and gives you no warning until it’s too late,” says Butch Walker. Oxford, England, Falcon is the only BBC-licensed manufacturer to faithfully reproduce the legendary LS3/5a broadcast monitor based on the original 1976 design. Falcon was founded in 1972 by Malcolm Jones, previously KEF’s first employee a decade earlier. As KEF’s senior development engineer, Jones did most of the design and development of the legendary KEF drive units: the B139, B200, B110, T15, T27 and the systems in which they were incorporated. Atlona is extending the reach of its whole-home AV systems into the residential and light commercial markets through a new partnership with Josh.ai, an industry leader in artificial intelligence for the home. The complete solution integrates Josh voice control platforms with Atlona HDR-H2H and PRO3 Series HDMI-to-HDBaseT matrix switchers. The simple configuration-based setup processes allow installersto offer intelligent, high-quality distributed AV for connected homes and small businesses. The Josh platform will self-discover the Atlona switcher on the network upon connection, accelerating the deployment process for custom installers and systems integrators. From this point, HDMI inputs and outputs are mapped and configured, with all connections clearly arranged by number on the Josh interface. Once live, users can move from room to room and request to watch or listen to content, with Josh’s room-aware microphone “hearing” the request, which is then processed within the platform. The Atlona matrix switcher then executes the appropriate signal flow. To reduce service calls and deliver additional benefits for clients, Luxul, a manufacturer of IP networking solutions, has announced self-healing capabilities for select managed network switches. Available via a free upgrade to firmware version 4.1.1 or greater, the new functionality empowers integrators with two advanced features: Auto-Recovery and Power Scheduling. Luxul's self-healing capability is currently available on the company's 12-port/8 PoE+ AMS-1208P, 26-port/24 PoE+ stackable L2/L3 AMS-4424P, 26-port/24 PoE+ AMS-2624P, 26-port/24 PoE+ XMS-2624P, 52-port PoE+ L2/L3 XMS-5248P, and 52-port stackable L2/L3 XMS-7048. With Auto-Recovery, devices connected to these switches by PoE no longer need to be manually rebooted when they fall offline or become unresponsive; the configuration in the switch triggers PoE-connected devices to reboot automatically. And with Power Scheduling, integrators can now trigger the switches to power PoE-connected devices on or off based on any schedule they create within the switch. "With Self-Healing, we're amping up the performance of Luxul switches to an entirely new level," says Mike Grubb, vice president of marketing at Luxul. "Imagine never getting another call about security cameras or other PoE-connected devices freezing up; your clients' switches will take care of them automatically. Furthermore, it's effortless to schedule devices to power down overnight, over the weekend, or whenever your clients request it. All it takes to realize these benefits is a free firmware update." Naim Audio, a British hi-fi manufacturer, is adding support for Apple AirPlay 2 to its wireless multi-room speaker Mu-so range. Apple AirPlay 2 enables advanced multi-room functionality and Siri voice control, with the Mu-so, Mu-so Special Edition and Mu-so Qb receiving the over-the-air update. Naim Audio’s Uniti range, including the Uniti Atom, Uniti Star and Uniti Nova will receive an Apple AirPlay 2 update in late November 2018. Drawing on 45 years of expertise in audio engineering, industrial design and streaming technology, the Mu-so, Mu-so Special Edition and Mu-so Qb combine the company's latest designs with high-quality audio. Support for Apple’s wireless proprietary technology allows the streaming of music – including Apple Music, Spotify, Tidal, YouTube, internet radio and podcasts – from an iPhone, iPad, iPod Touch, Mac computer and Apple TV to a compatible Naim device. Once the update becomes available, the Naim app will prompt customers to perform an over-the-air update. PS Audio has announced the availability of Snowmass, the sixth OS upgrade for its DirectStream DAC. Ted Smith, PS Audio collaborator and lead designer of the DirectStream and DSJ DACs, has periodically written new OS, which reconfigures the basic structure of the DACs. The FPGA-based architecture of those models allows integrators to download new operating systems to update their clients' DACs in the field. “For Snowmass, I rewrote the FPGA code that upsampled lower rates of PCM to 352.8k [or 394k, depending]. I wanted to get better control of the times at which things happened, in order to have more control of noise generated, and of the jitter generated by the FPGA. I could also get a better balance of FPGA resources needed to do the filtering. In the old upsampler, I got about 144dB S/N in the upsampling, in the new code I have about 156dB S/N," says Smith. "Lowering noise and jitter makes everything better---352.8k PCM and DSD will also have a quieter background and essentially everything else mentioned, but perhaps not with the magnitude of improvement heard with CD." Two of the biggest names in custom electronics have partnered: SnapAV and Nest Pro. SnapAV now offers professional integrators a choice of Nest thermostats, video doorbells and cameras, security products and voice control solutions from Google. In addition, Nest products work with devices from top companies such as Lutron, Philips, Vivint, LifX and Yale to help integrators deliver complete smart-home systems. To learn more about becoming a Nest Pro dealer click here. eARC (Enhanced Audio Return Channel): A feature introduced for HDMI 2.1, eARC will allow for additional formats to be transported including the below. Moreover, eARC includes a mandatory information channel telling the TV which sound formats are supported by the AVR so that the TV outputs best possible format automatically. IMAX Enhanced: The Denon AVR-X8500 and Marantz AV8805 will be the first receivers equipped with IMAX Enhanced technology. As IMAX Enhanced content becomes available, owners of these products will have access to advanced audio and visual formats. The IMAX platform provides adjustments modeled on how the IMAX theatrical sound system operates, including an IMAX audio mix that is translated for home theater environments, and exclusively delivered using a special variant of the DTS:X codec. Smart Remote Management (SRM) and Web UI: Audio, video, speaker and input functionalities will support via web UI for the Denon AVR-X8500H, Marantz AV8805, and Marantz SR8012. Denon and Marantz add, this Web UI and remote monitoring and management are made available by the ihiji invision and Domotz pro monitoring platforms. The new Kaleidescape app allows users to browse for movies and purchase content. According to the entertainment service provider, the app is designed for easy navigation through featurs such as gesture control, and its interface is synched with the onscreen information that homeowners see when they use their Kaleidescape systems. Kaleidescape says the app is available on the iOS platform for use with iPhones and iPads. VIZIO, Inc., has announced the rollout of all-new features to its smart TV experience: SmartCast Home. The expanded functionalities allow users to access more entertainment through new apps like CBS All Access and personalize their SmartCast Home experience via the all-new App Sorting feature. Users can sort and reposition their favorite apps to enable quicker access to those most commonly used. The latest iteration of SmartCast Home debuts today and is rolling out via free cloud-based updates to VIZIO SmartCast 4K Ultra HD TVs and displays, as well as select HD and Full HD models. Capitol, a national consumer electronics distribution source for residential systems and light commercial contractors, has announced it is kicking off the holiday selling season with distribution of its November flyer that features products representing the smart home, audio, video, and networking categories. The flyer is a Capitol tradition. Among the top-shelf brands included this year are Nest, Ring, LeakSmart, Onkyo, Pioneer, Sony, and LG. “This holiday season Smart Home leads the pack, thanks in part to the abundance of well-designed, easy-to-use products introduced over the past year,” says Curt Hayes, president and CFO, Capitol. “Companies like LeakSmart are paving the way for innovators who are tying non-traditional categories such as home plumbing into the home network, with designs that are reliable and easy to master." D-Tools, Inc., a global developer of data-driven system integration software, has announced a new update to its on-premises System Integrator 2018 (SI 2018) software release: SI 2018 R1. Available immediately worldwide, SI 2018 R1 adds new productivity features and enhancements that enable system integrators and technology managers to streamline their business processes and increase profitability, while simultaneously reducing overhead and improving project accuracy. SI 2018 R1 offers efficiency improvements in virtually every functional area of the software, including catalog management, projects and reporting, as well as enhancements to the D-Tools Customer Portal, multiple currency support, and third-party integration for automatic tax lookup. Brilliant, a company bringing decentralized home control and automation to consumers, including options for voice and touch control, has announced that it has expanded its suite of controls to include August Smart Lock, a provider of smart and secure front door solutions. Integrating with August Home brings Brilliant users more convenience and remote control over their homes. Users can lock and unlock their door directly from specific rooms on their Brilliant Control or on the go with their Mobile App. They can also set up August as part of their home automation scenes. Building on the successful introduction of its Palladiom Shading System, lighting and shade control leader Lutron Electronics is introducing two new bracket finishes. The addition of satin brass and dark bronze rounds out the current Palladiom bracket offering of satin nickel, black anodized, clear anodized and pure white finishes. The Palladiom Shading System is an exposed bracket system designed for luxury residences. Introduced in 2017 at CEDIA Expo the system is offered through select Lutron dealers specializing in shading solutions for luxury clientele. Simpfony LLC has announces the addition of wireless zones to the Simpfony whole-home audio solution. All Simpfony S2 models can now utilize Apple AirPlay-compatible devices as wireless zones, complementing the existing selection of high-resolution wired zone options. This enhancement is immediately available via a simple software update at no additional cost. The option can be used for hard-to-reach areas where pulling wire is difficult or impossible, and once updated, all wireless devices are full-fledged zones, providing all the functionality of wired zones with the convenience of wireless. Legrand, North & Central America and Lumileds have announced a partnership agreement that will bring to market a simple an easy-to-install plug-and-play solution that delivers tunable-white light. Under this agreement, Lumileds will provide intelligent light sources (LUXEON-based solutions) through its award-winning Matrix Platform that are uniquely characterized and programmed to work with Legrand’s Wattstopper blanco tunable white logic modules within the Wattstopper Digital Lighting Management (DLM) lighting controls solution. Lumileds joins existing Legrand partnerships in tunable-white light engine as the exclusive LED array provider. “The lighting industry is beginning the transition from providing only static white light to enabling dynamic end user selectable color temperature solutions as a subset of what is becoming possible with intelligent and human centric lighting fixtures and controls,” says Steve Barlow, SVP/GM of Lumileds Illumination Business. Funai Corporation, Inc., has announced the availability of the first Magnavox TV series under the Roku TV licensing program. The new Magnavox Roku TVs will feature the Roku OS offering an intuitive home screen, easy to use remote and access to 500,000-plus movies and TV episodes alongside other inputs like cable boxes, HD antennas and game consoles. Debuting this month in the U.S., will be the 32-inch 720p LED LCD Magnavox Roku TV. Additionally, a 50-inch 1080p Full HD Magnavox Roku TV model is also set to be available soon. Luxul has issued firmware update 6.3.1 for its XWR-3100 & XWR-1200 wireless routers. The company has issued firmware update 6.2.1 for its XAP-1510; XAP-1440; XAP-1410 & XAP-810 wireless access points. The last firmware update that Luxul issued is for its ABR-5000; ABR-4500 & XBR-4500 wired routers. Screen Innovations (SI) has announced that its ambient-light-rejecting Short Throw (ST) screen material is now available on Solo Pro. The Solo family of screens are highly customizable motorized screens that can be carried and installed in 5-minutes by a single person. Short Throw, which uses a microscopic lenticular optical technology (think window blinds), is best suited for ultra-short throw projection applications where the projector is located directly below the screen at throw ratios as close as 0.1 times the image width. This technology can successfully reproduce 8K resolution while rejecting up to 90% of the ambient-light in the room. “The extraordinary Short Throw screen material is very difficult to work with due to its optical qualities. It took almost two years to perfect a method to manipulate it to function in a motorized system. Thankfully, SI has the manufacturing capability to not only develop this methodology, but we also have the capacity to create repeatable results to scale for production.” Says Tom Nugent, chief of material technology, Screen Innovations. Funai Corporation today announced the availability of the first Sanyo Roku TVs in the U.S. The new 32-inch LED LCD Sanyo Roku TV, featuring the Roku OS, Dolby Audio, and Brilliant Motion Rate 120, will be exclusively available at Walmart stores with an everyday low price of $128. "By delivering this level of performance and quality at such a compelling price, we’re enabling smart households to enjoy the amazing entertainment that the Roku platform provides access to,” said Youssef Ibrahim, Sr. Product Marketing Manager at Funai Corp. "This unit recently debuted at Walmart Canada and was very well received, we're excited to now make it available in the US." Certain Pioneer branded home audio products will receive a free firmware update enabling playback of MQA. With support for both streaming audio, local file, and whole home audio, the N-70AE and N-50AE family of network audio players can be used as the hub for all high quality audio pursuits. The NC-50 and NC-50 DAB are network audio players with a built-in CD player and stereo amplifier. Enjoy your music by simply connecting speakers. MQA music for Pioneer devices is available from various music streaming services such as TIDAL and music download sites, such as Onkyo Music in the U.S., U.K., Germany, and e-onkyo music in Japan. MQA with Onkyo and Pioneer are working closely for playback support on more home audio products, and will announce their availability in the coming months. WiSA LLC, an Association of consumer electronics brands and founded by Summit Wireless Technologies, has announced the certification of the “Link” WiSA USB Transmitter from Association member Axiim. The Axiim Link plugs into any WiSA Ready audio source including TVs, gaming systems and PCs and allows them to easily connect to any speakers certified by the WiSA Association. The Axiim Link transmitter is also the first and only wireless, high-resolution device designed for Xbox One and Windows PCs that is also WiSA Certified. “The Axiim team is super excited to support the growing number of smart TV display manufacturers bringing WiSA-Ready products with immersive sound capabilities to market in 2019 and enabling the Xbox gamer, the PC gamer, and Esports enthusiasts to get in on the action with a full room of directional sound” says James Hammer CEO of Axiim. Lutron Electronics is giving its dealers a totally revamped set of online web-based tools to manage all their key interactions and activities. From sales and marketing information, to programs and promotions; from project design and order; to servicing deployed projects – the myLutron platform makes it easier than ever for dealers and Lutron to do business together. myLutron is currently built on four key pillars: myBusiness, myProjects, myOrders, and myService. It provides dealers with more timely and integrated information – bringing efficiency and effectiveness to every business and project process. projects,” says Rich Black, director of residential business development at Lutron. The all new “myBusiness” pillar will provide a variety of sales and marketing support to dealers through range of tools and mechanisms. Roku has announced that its Roku Streaming Stick+ is now priced at $59.99. The company says this new, lower price is permanent, and it provides users with 4K video capabilities along with voice control functionality. Google announced users can now ask a Google Assistant built-in device such as Google Home or a Google Assistant app to control music across Denon, Marantz and HEOS products to enjoy the convenience of Google Assistant with quality sound. The program is called, “Works with Google Assistant,” and makes Denon and Marantz products with HEOS built-in the first in the industry to support all three major voice engines, including Google, Siri and Alexa. VIZIO, Inc., has announced the introduction of expanded Google Assistant actions for VIZIO SmartCast TVs, granting consumers access to a wider range of voice control features. VIZIO SmartCast TV users with a Google Home or Google Assistant-enabled device, like the Google Home Hub, will have the ability to use simple voice commands for input selection as well as pausing, resuming, stopping, fast-forwarding and rewinding content. The new VIZIO SmartCast features for Google Assistant will be available to VIZIO SmartCast TV customers in the coming weeks. Next Level Acoustics has announced its new line of Sonos compatible products geared for the custom integrator. Other products from Next Level Acoustics include the Sonos Beam adapter for the UM1 bracket (UM1-B). This product is said to allow the Sonos Beam, when paired with theSonos Beam on-wall bracket, to line up flush with the front edge of the display. Next Level points out the product is fully articulate and pivots with the beam and display when using an articulating mount. Just weeks after the CEDIA Expo 2018 show in San Diego, Screen Innovations (SI) has announced a new sales and distribution partnership with Control4. SI is a manufacturer of high-performance projection screens and motorized window shades for the custom electronics industry, and it will be offering its line of quick-ship projection screens through Control4's product catalog. Focused on making order ability as simple and seamless as possible, SI will make standard sized screens available in Control4’s online store. Dealers can now place a single purchase order and receive the same innovative screens with one point of contact. MoFi Distribution has announced the addition of two new brands to its product lineup: Manger and finite element, two manufacturers each with a long history and both based in Germany. Manger is a highly regarded speaker manufacturer best known for their distinguished "Bending Wave" sound transducer. Johnson Controls, has announced it has acquired the assets of Lux Products Corporation (LUX), a leader in residential thermostats and smart home products. LUX markets several successful residential and commercial lines ranging from timers to smart home thermostats including Kono and Geo. "The acquisition of LUX strengthens our portfolio in the consumer retail channel and offerings in thermostats," says Chris Eichmann, vice president, general manager of Johnson Controls. "We are excited to work together with LUX to bring great products to even more customers, leveraging Johnson Controls' resources to drive continued innovation." This announcement comes shortly after the launch of Johnson Controls' new GLAS, the new smart thermostat that features a translucent OLED touchscreen display, among other high-tech features. For Johnson Controls, the LUX acquisition enhances its commitment to thermostats, a natural progression from the company that invented the first room thermostat more than 135 years ago. The move also enables faster product development cycles, improves customer service capabilities and supports greater product innovation.